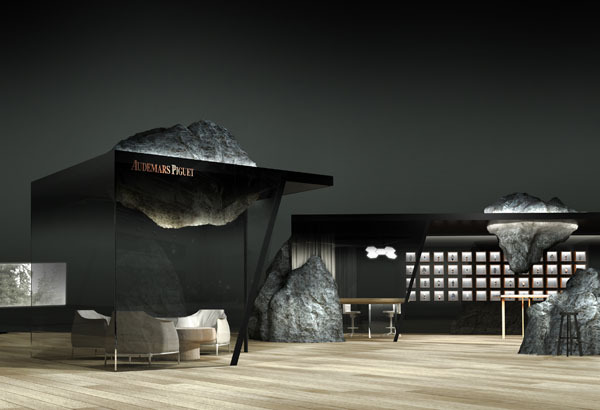 Audemars Piguet to unveil new lounge at Art Basel in Hong Kong 2014 from 14 – 18 May 2014 by leading French designer Mathieu Lehanneur, featuring a video installation about the brand’s origins by Austrian video artist Kurt Hentschläger. 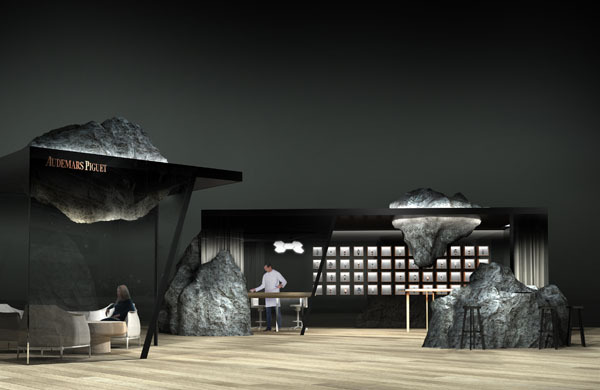 In its second year as a global Associate Partner of Art Basel, Audemars Piguet is delighted to today announce plans for a new lounge created by leading French designer Mathieu Lehanneur as well as a new piece by Austrian video artist Kurt Hentschläger inspired by Audemars Piguet’s home in Le Brassus in the Vallée de Joux. The innovative design by Lehanneur will provide the setting for a reflective video piece by Hentschläger and an exhibition of exceptional historic and contemporary timepieces, including a display of six new models of the Royal Oak Offshore in 42 mm. The lounge will be on show at Basel and Miami in december. Mathieu Lehanneur’s imaginative designs take inspiration from the worlds of science, nature and technology. For this new design concept, Lehanneur has used the latest technology in resin and fibre moulding to cast replicas of the rocks he discovered in the Vallée de Joux, Audemars Piguet’s home in one of Europe’s remote and pristine forest regions. Exploring the themes of technology versus nature, Lehanneur has taken exact prints of the ancient Swiss rocks to create his own new versions of nature, seemingly mastering the art of recreating the landscape of one of Europe’s most isolated and challenging environments, all executed without leaving behind any trace of human activity on the environment. 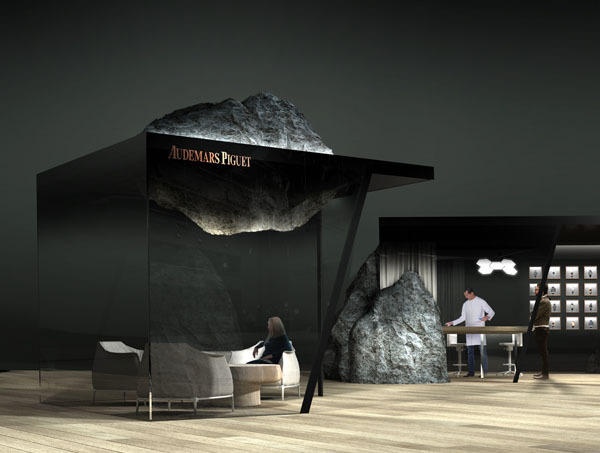 Lehanneur’s cast resin and mineral rocks will be displayed in the Audemars Piguet booth in the Collectors’ Lounge, bringing the rugged, natural landscape of the company’s origin to each global edition of Art Basel in 2014. Audemars Piguet has also commissioned a new film work by Austrian video artist Kurt Hentschläger for Art Basel this year, which will be displayed across three screens on the booth in the Collectors’ Lounge. Hentschläger has worked predominately with time-based media, light and sound for over 30 years and his atmospheric film for Audemars Piguet depicts scenes from the iconic Vallée de Joux, captured during his visit. The film presents the co-existence of nature and technology, exploring how they can inspire and affect one another, thereby offering a new perspective and view of the captivating landscape that has played an influential role in shaping the story of Audemars Piguet and the development of fine watchmaking. Following Art Basel in Hong Kong, the Audemars Piguet booth and exhibition will travel to the Collectors’ Lounge at Art Basel in Basel from 19 – 22 June 2014, and Art Basel in Miami Beach 4 – 7 December 2014. Audemars Piguet is the oldest fine watchmaking manufacturer still in the hands of its founding families (Audemars and Piguet). Since 1875, the company has written some of the finest chapters in the history of haute horlogerie, including a number of world firsts. In the Vallée de Joux, at the heart of the Swiss Jura, numerous masterpieces are created in limited series embodying a remarkable degree of horological perfection, including daring sporty models, classic and traditional timepieces, splendid ladies’ jewellery-watches, as well as one-of-a-kind creations. The famous 1972 octagonal Royal Oak, the first luxury watch to be made of stainless steel, is widely recognised as one of the most important innovations in watchmaking. Art Basel stages the world’s premier art shows for Modern and contemporary works, sited in Basel, Miami Beach and Hong Kong. Defined by its host city and region, each show is unique, which is reflected in its participating galleries, artworks presented, and the content of parallel programming produced in collaboration with local institutions for each edition. In addition to ambitious stands featuring leading galleries from around the globe, each show’s singular exhibition sectors spotlight the latest developments in the visual arts, offering visitors new ideas, new inspiration, and new contacts in the art world. Please visit artbasel.com for additional information. 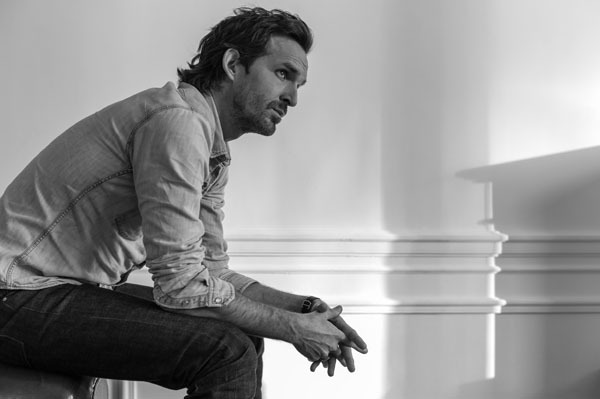 Mathieu Lehanneur is a French designer at the forefront of the international design scene. Innovatively, he combines design, science, art and technology as poetic-communicative components to create humanistic projects and achieve maximum welfare for human beings. Graduated from ENSCI-Les Ateliers |’École Nationale Supérieure de Création Industrielle, his works are part of the permanent collections at the MoMa (New York/US), Centre Pompidou (Paris/FR), SFMoMa (San Francisco/US), the foundation of contemporary art Frac Ile de France (Paris/FR) and Design Museum (Gent/Belgium). Mathieu Lehanneur also designs for brands such as Veuve Clicquot, Issey Miyake, Christofle, Cartier, Poltrona Frau, among others, with the same proficiency as he creates spectacular projects for Saint Hilaire Church (Melle/France), the Diaconesses Hospital (Paris/FR), the new hotspot of the Parisian scene, Electric, for the Pullman Hotels (London and Paris), for the Centre Pompidou (Paris/FR), and for the upcoming cultural center Lab Cambridge (Boston/US), opening next July. Chicago based Austrian artist Kurt Hentschläger creates audiovisual performances and installations. He began to exhibit his work in 1983, and since has been working predominantly with time-based media, light and sound. His current work continues to investigate human perception and the impact of new technologies on both individual and collective consciousness. Selected presentations include the Venice Bienniale, the Venice Theater Biennial, Stedelijk Museum Amsterdam, Fondation Beyeler Basel, PS1 New York, Creative Time, Inc. New York, MAC – Musée d’Art Contemporain Montreal, MAK – Museum of Applied Arts Vienna, National Art Museum of China Beijing, National Museum for Contemporary Art Seoul, ICC Tokyo, Arte Alameda Mexico City, MONA – Museum of Old and New Art, Hobart, Tasmania. In 2012 he was commissioned as part of the Cultural Program of the 2012 London Olympics / London Festival to create CORE, a symphonic installation in an industrial age machine hall. He is currently a full time Visiting Artist at the School of the Art Institute of Chicago. The great-grandson of Edward Auguste Piguet, one of the founders of Audemars Piguet, was born on 13 June 1959, a few kilometres from Le Brassus, birthplace of the family business, where he spent all his childhood holidays. “My grandfather, Paul-Edward Piguet loved to tell me stories of the factory and instilled his passion for watchmaking in me,” he recalls. “He was profoundly attached to the Vallée de Joux. For him, the company did not belong to individuals but to the region itself. His mission was to ensure that it remained in the valley and was passed down through generations.” After a career managing a company dealing with the physics of materials, this enthusiastic long-haul traveller, having criss-crossed the American and African continents, joined the brand’s Board of Directors in 1997. He took over from his aunt as Administrator in 2000. “I see myself as just one another link among many in this company,” he says.